Sweat it Out or Sleep it Out? 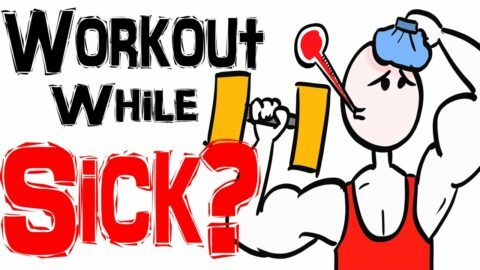 Ever wonder if you should continue working out when you feel under the weather or if you should just take some time off? Often times people will say to “sweat it out!”, but is this the best answer? Studies show no definite answer to this question. 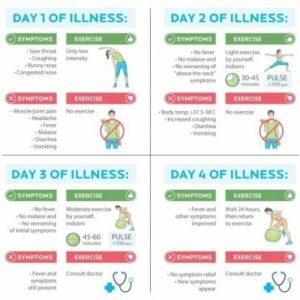 An article provided by WebMD, Exercising When Sick: A Good Move?, provides insight from many experts. The common finding was that it depends on your sickness. One doctor provided a good rule of thumb when making the decision to work-out or skip; “If your symptoms are above the neck, including a sore throat, nasal congestion, sneezing, and tearing eyes, the its okay to exercise, if your symptoms are below the neck, such as coughing, body aches, fever, and fatigue, then it’s time to hand up the running shoes until these symptoms subside.” If your sickness is “above the neck,” there is evidence supporting the benefit of physical activity while sick. However, the type of exercise is an important factor to address. Tough, extraneous workouts that include heavy breathing, sweating, and discomfort awaken a stress response in the body. While down with a sickness, our body is unable to handle the stress brought on by tough workouts. A better form of exercise to engage in when sick would be walking, riding a bike, swimming, yoga, or Pilates. If you do chose to “sweat it out!”, don’t forget gym etiquette. Be sure to wipe off the equipment after use to prevent the spread of germs.